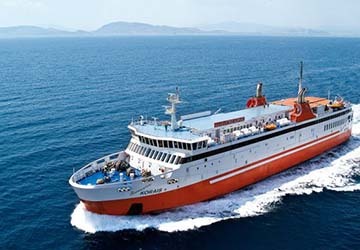 The Folegandros Serifos ferry route connects Cyclades Islands with Cyclades Islands and is currently operated by 2 ferry companies. The Zante Ferries service runs up to 3 times per week with a sailing duration of around 2 hours 30 minutes while the Sea Jets service runs up to 14 times per week with a duration from 2 hr 25 min. So that’s a combined 17 sailings on offer per week on the Folegandros Serifos route between Cyclades Islands and Cyclades Islands. Compare now and get the best fare at the time that you want to travel. Prices shown represent the average one way price paid by our customers. The most common booking on the Folegandros Serifos route is a car and 2 passengers. The Greek island of Serifos lies in the Aegean Sea and is one of the Cyclades group of islands. It is a popular island with tourists for a relaxing vacation and is characterised by its tradition whitewashed villages, pretty harbours, golden beaches and lovely landscapes. Compared to some other Greek islands, Serifos does not attract particularly high numbers of tourists which means that it has managed to retain some of its authentic Greek atmosphere. Visitors to the island have the choice of lazing on one of its 72 beaches or alternatively they can go cycling or hiking on one of the seven trails on the island. There is also a World War II shipwreck which is popular with scuba divers and a 16th century fortress-like Monastery of Taxiarches. The most picturesque spot on the island is the village of Chora and has been built on the slopes of a mountain that offers locals and visitors lovely views of the Aegean Sea. The most visited places on the island are the towns of Livadi and Livadakia.